I posted up about Launch Control a few days ago. o we asked and asked and asked. We asked three Nissan employees: one from the public relations department, one from engineering and one high-ranking executive. The first two confirmed its removal was being considered seriously, but the decision had not yet been made. Then the high-ranking executive confirmed the bad news. "It's gone," he said when asked if launch control would return in 2010. "We just don't want to deal with the warranty nightmare anymore. It'll make the 2009 GT-R really special. 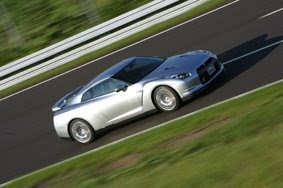 It'll be the only R35 with launch control." Now what happens to 0-60 times. Is this really what they want to do ? Now the aftermarket is going to have to figure out launch strategies for the car. Thanks to the asshat that broke his trans after using the launch control dozens of times, the launch control is gone. Oh well, hope the aftermarket steps up. The mistake nissan did in first place was that they drove the 0-60 times with LC and that they sed "you can use it as often as you want".They used the LC for there Advertising. And now the buyers are saying "they told us ,we can use the LC as ...". And now the lawyers have to deal with it. Porsche,Ferrari,BMW... all have LC,but none of them sell cars with it,the just say the have it and "use with caution".